"Using positive vs. negative dog training methods correctly"
What does that mean? … It means learning (conditioning) that -what I do- (operant, as in operator) has a consequence. You might have heard about positive vs. negative training methods, or using reinforcement or reward vs. punishment. All training methods, no matter how they call them, are based on the principles of classical and operant conditioning. Both punishment and rewards are an integral part of this theory that explains some of the most basic ways of learning, and it applies to all of us, animals. 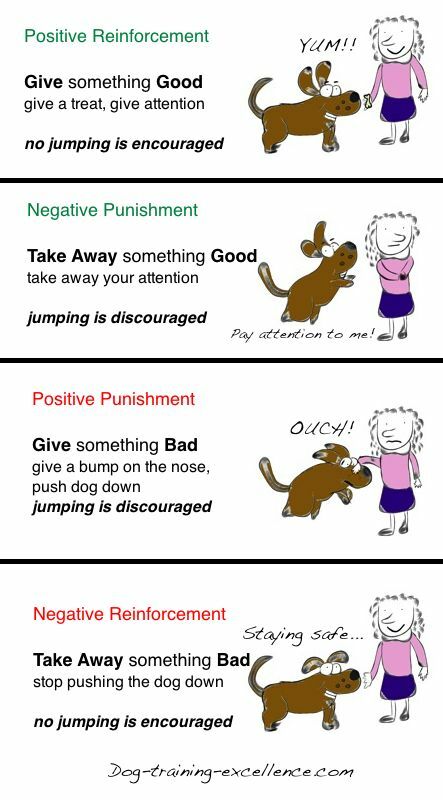 When you learn the psychology behind dog training through operant conditioning examples you will be able to more effectively teach your pooch to do what you ask. Let me tell you a little extra secret too: this concept will also become handy when dealing with unruly kids, a difficult mother-in-law, a messy husband/wife or a misbehaving cat! It is basic animal psychology and that is why it applies to all species. Dog trainers and people in general use the term “positive” to imply that they use rewards as the main dog training technique. They use “negative” to imply an obedience method based on corrections. Operant conditioning is how we learn to associate our own behavior with a consequence. Let’s break those 4 possibilities down into their basic components. ...do not mean “good” or “bad". Positive means to give (i.e. : give a treat, give a jerk on the leash). Negative means to take away (i.e: take away your attention, take away the pressure on a choke chain). So, you see? positive can be “good” or “bad” depending on what you are giving your dog. And negative can also be “good or bad” depending on what you take away. ... do not mean “good” or “bad” by your standards. Reinforcement means that the behavior will happen more often. Punishment means that the behavior will happen less often. Reinforcement and punishment are defined by the outcome! The four possibilities are often explained using this 4 quadrant chart. You notice that your dog does not sit next to you more often, it actually happens less often! … because the pat on the head was not a reward for him. He actually hates when you pat him on the head! (some dogs really do, if this is your case, rubbing down the chin is better). So, you did give (positive) him something - the pat on the head - BUT there is a behavior that happens less often (punishment). You just used positive punishment! A reward is only a reward if the animal increases the likelihood of the behavior! An aversive event is only a punishment if the animal decreases the likelihood of the behavior! To help you understand the four possibilities use the following "No Jumping" example and think - What option am I using?- with everything you teach your furry friend! If you are following this so far, you will come to realize that these 4 possibilities are often different sides of the same coin. For example, a dog barks at the dinner table begging for food, the owner gives the dog food. What is going on? From the point of view of the dog, he was given (positive) food for barking, so in the future it is very likely that he will continue barking for food at the table (Reinforcement). On the other hand, from the point of view of the owner he hated the constant barking but as soon as he gave the dog food, the barking stopped (negative), so it is likely that the owner will continue giving food to the dog at the table to keep him quiet (Reinforcement). You see? you have two events happening simultaneously but they are two different squares of the quadrant. It all also has to do with how you phrase things because a dog that barks less often (punishment: behavior decreases) is also a dog that is quiet more often (reinforcement: behavior increases). Also, the way each possibility is defined depends on the timing at which the punishment or reward are given. If you give it late, you might be rewarding/punishing something completely different from what you thought you were. In the example above, if the owner chooses to give food when the dog is quiet instead, then the quiet behavior will increase instead. You could use either of the 4 possibilities of Operant Conditioning. The idea is to use the most effective one for each particular behavior. I personally discourage dog parents and trainers alike to rely on positive punishment. It is very hard to use correctly! It is not effective in the long term because your pooch will figure out a way to do what he wants and avoid the punishment (kind of like using loopholes in our law system). It discourages you canine companion instead of making him eager for a training session. It can actually make your dog "shut down". He won't try new things because he is afraid he might get punished. If you are interested in learning more about learning principles I highly recommend these 2 books. They are written for you and me (dog trainers and dog owners/lovers). These books skip all the hard-to-remember jargon of textbooks and still teach you everything you need to know...and they are fun to read too! Excel-erated Learning by Dr. Pamela Reid is a great book that goes beyond operant conditioning and into sensitization, schedules of reinforcement and more. It is well written, concise and inexpensive. Karen Pryor's Don't Shoot the Dog is a classic! If you haven't already, you MUST read this book now. I have read it a few times myself. Up until now I gave you information on how to make your dog do a behavior more or less often. ...You want your dog to do the behavior on command only? The principles of Operant Conditioning also work with a "Red light-Green light" system. Your cue or command will be the green light, if you say it and your dog responds - Mark and Reward! If you don't say it and your dog does the behavior anyway - Ignore it! With many repetitions (remember Practice Practice Practice!) your pet will learn that he only gets a reward when he responds to the command. The absence of the command will be the red light. Before you add a verbal cue or hand signal your dog should be "throwing" the behavior at you! Which means he is doing the behavior often during a training session. Say the command and wait. Reward the first behavior that happens after the command. Repeat many times. Don't say the command and ignore any behaviors that happen. Repeat alternating with the previous step. When your dog is reliably responding to your verbal command (8 out of 10 times) you are ready for the next step! Read "How to get a reliable dog training command" for a step-by-step guide! I will be helping you every step of the way as we learn how to teach your dog some basic commands. I promise that with practice, operant conditioning, will become second nature to you! Now it's time to learn about Extinction and how it can help us get rid of problem behaviors! Click to learn more!